KID is a new Children’s Fashion Trade Show dedicated to bring together a carefully selected community of professionals, handpicked from all over the world for their creative vision and commercial potential. KID is an innovative project, a cross between a showroom and a traditional trade show, framed by a curatorial ethic which favors quality over quantity. For its premiere in Paris, KID will provide a platform for outstanding products, with an emphasis on modern key values: style, audacity, attention to detail, and fair trade products. In order to welcome its participants in the best conditions, KID is located in the heart of Paris, at an easily accessible and truly fabulous location. The spirit of our historical building will be preserved thanks to a minimalist and elegant design. KID setting inspired by the department store esthetics makes a perfect backdrop for the collections and invites buyers to discover. For its 3rd edition, KID has moved to a bigger and very unique venue, still in the heart of Paris. The historical “Le Tapis Rouge” was one of the first Parisian department stores, a perfect place to confirm our own identity. The show will be set up as our very own ideal KID department store. 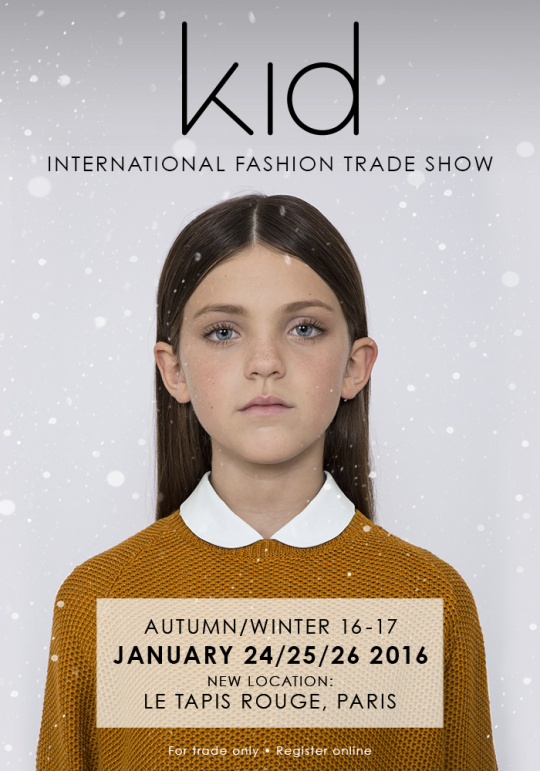 According to the children fashion calendar, KID has also moved its dates one week ahead and will be starting from Sunday 24th to Tuesday 26th of January. KID has worked to enlarge and sharpen its strong brand mix. In addition to the brands featured during the last Spring/Summer 2016 edition, new and established designers have joined our curated selection, for the sake of attracting buyers from the French and international markets. As a talent spotter, KID has also selected new exhibitors who are presenting their collections for the first time in France. Among those new arrivals, exclusive collections coming from the whole the world can be discovered, including Europe, the United-States, Asia, Australia, and the Middle East. With a strong, rich and methodical selection, KID confirms its selective and qualitative position dedicated to the most demanding and curious buyers.